Making compromises is what you usually expect if you search for the best mountain bikes under $500, but the possibilities are great when you know what to look for. Aluminum frame, a higher number of gears and disc brakes in a motorcycle style are the advantages that really make a difference. Suspension forks are also important, because they hugely improve overall comfort. Pay attention to these details if you want to get a quality bike. Take a ride and go wild, without spending a fortune on an unforgettable off-road adventure. 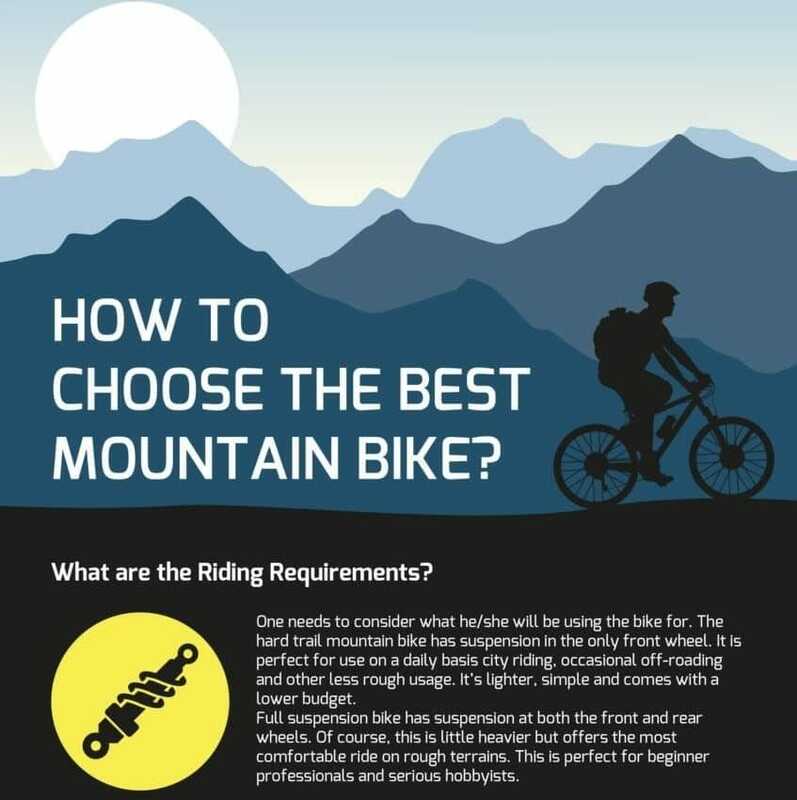 How to Choose the Best Mountain Bike? What Mountain Bikes Should You Pick For You? a) When to Go for Single Speed Mountain Bikes? b) When to Choose Hardtail Mountain Bikes? c) Which Type of Mountain Bike to Go for During Downhill Activities? d) Why Ride a Folding Mountain bike? e) Why Purchase an Electric Mountain Bike? Due to advances in the technology, the modern day market is saturated with innovative and quality bikes at varied costs. Tastes, purpose, and specific requirements influence the choice of a particular bike, hence what resonates with one biker may not necessarily resonate with another. If you`re searching for a mountain bike that can hold up any weather condition or road, this 24-speed Gravity FSX 1.0 Dual Full Suspension Mountain Bike is a rock-solid choice, which does not necessarily cost a fortune. As far as entry-level bikes go, the Gravity FSX1.0 outshines any other department store bike in sight. The bike looks pretty good and is described as a happy balance between ruggedness and elegance. Interestingly, neither side of the coin has to sacrifice much for the combination of work. The bike`s popularity among cycling aficionados has risen, thanks to the consistent performance and reasonably low price. It has proven to meet professional standards of quality in many ways. No wonder many veteran bikers have given the bike a shot. Apart from offering astounding quality components, it offers adjustable suspension; both at the rear and front. Additionally, the excellent craftsmanship and advanced technology are a bonus. The sophisticated, powerful disc brakes and the classy Shimano 24 Speed drivetrain will take definitely take your biking experience to an entirely different level. If you`re looking for an entry-level bike that is light, affordable, smooth and advanced, this is the bike to go for. Powerful Tektro Novella brakes for swift and precise stopping. CantiBeam SinglePivot technology for optimal efficiency and performance. Versatile; the adjustable saddle allows all height sizes to ride comfortably. Front And Rear Derailleurs for fast and smooth changing of gears. In short, they provide jolt-free riding experience and higher control. 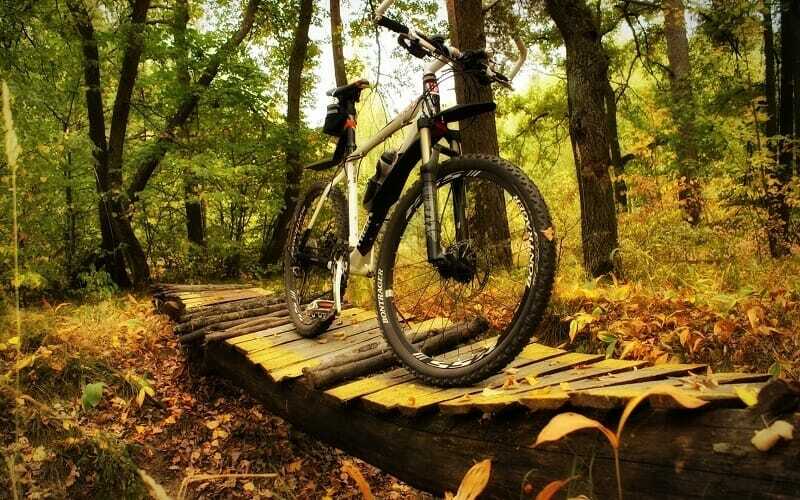 Hard tail mountain bikes have specific strengths that are unavailable in other types of bikes such as road bikes and can effortlessly perform several biking activities. The Diamondback Bicycle Overdrive is a perfect description of a hard tail mountain bike. It has the power to transfer the pedaling power to the wheels, enhancing its acceleration power and strength. This enables the bike to climb mountain trails easily and fast. Being an entry-level bike, Diamondback Bicycles Overdrive Hard Tail Mountain Bike offers you premium service for a long duration and guarantee a safe biking experience, without causing a significant dent to your pocket. Very few brands can offer such services at a slashed rate. Though relatively cheap than other brands, don`t assume its build with inferior components, though. Diamondback has used components from prominent brand names such as SRAM and Shimano. This bike offers superb comfort and can cope with the demands of any rugged mountain trails. Additionally, it has a basic operational system. The 24 gear shifter from Shimano is easy to use and handy especially If you are participating in a competition or sports. A durable hand-constructed 6061-T6 aluminum alloy hard tail frame for weight minimization and a coherent and rigid mountain ride. A 24 Speed Gear Shifters from Shimano. The simple operation system of the gears is suitable for entry- level riders. Similarly, the super speed is handy if you`re to participate in a competition or sport. The 27.5” Wheels offers goodies of both worlds; the smoothness of a 29” and easy handling of a 26”. Moreover, superb traction and momentum are easily achieved. As such, a biker will always be in control even at terrific speeds. The Hydraulic Disk Brakes helps you achieve smooth stops devoid of any jolting and a safe action for accident prevention. They Say the best way to see the outdoors is on a bike. Carrying you effortlessly as you’re comfortably perched on the seat, a bike sends you to places other means would not. Therefore, having a good mountain bike like the Diamondback Overdrive Hardtail, where won’t you go to? This bicycle is the perfect outdoor companion. Diamond bike did not compromise on strength and durability as they created a bike that not only stands the test of time but also does it with verve. The Hardtail is fast, sturdy and lightweight. Without further ado, let’s take a look at some of its features. Did I mention that the Overdrive ST Hardtail is durable? Well, it is. Built of aluminum, those knocks and bumps won’t give it a bruise. If you’re vigorous on the trail, there’s no need to worry about its condition after a ride. The aluminum material also gives it the wonderfully lightweight quality. At only 32.3 pounds, the Hardtail Overdrive is easy to carry into the house or over obstacles. Yes, that’s right, this bike’s Shimano 3 by 8 shifters gives you access to 24 speeds to choose from. So if you’re going up an incline, for instance, a hill, there’s a gear setting for that. Perhaps you’re on a descent? Don’t worry, among the 24 different settings; there’s just the perfect one to safely get you down a hill. On flat ground, the Hardtail is fast. And when I say fast, I mean adrenaline is pumping fast. Being a mountain bike, this bicycle is meant to take you to terrain that isn’t mild. So to be equipped with the state of the art Suntour XCT Fork suspension, the Hardtail Overdrive will comfortably take you over those bumps and depressions, sucking up the shock, thereby keeping you comfortable enough. Collaborating with the 27inch wheels, this bike effortlessly rolls over any obstacles on your path. The Diamondback has a hard wearing aluminum frame. It is lightweight, weighing in at only 32.3 pounds. The bike bears the Shimano 3 by 8 shifters that have 24 speeds to choose from. With the Suntour XCT suspensions, the bike easily absorbs shock from uneven terrain. The 27.5-inch wheels are excellent in going over obstacles. The Textro Aires mechanical disc brakes work perfectly in all conditions. Do you ever want to take long rides across the towns and streets with ultimate comfort and great speeding ever? This is the bike you need to start riding on and forget about the uneasy rides. Laurito is a bike that is well known for great comfort and satisfaction throughout your ride. This is reflected by the great features it contains. This Diamondback Bicycles 2016 Laurito Hardtail Complete Mountain Bike comes along a step through frame meant to assist you to get on top of the bike easily. This is not present in many bikes across the global market. The large wheels on this bike roll over all types of surfaces smoothly offering you unstoppable rides. The swift shifters allow you to change the gears quickly and easily. This is most definitely the bike to have for those who are passionately into serious riding. The Vilano Ridge 2.0 MTB is the perfect companion for your on-road and off-road escapades. It has been built to take on roads, pavements, uneven paths, and dirt trails with ease. It`s artistically crafted and is composed of some of the best workmanship. This bike will surely guarantee the worth of every penny you spend. Though it rides and looks like an opulent and high-end mountain bike, it comes at a price you can live with. First, the bike comes with a lightweight and butted 6061 aluminum alloy, which has been hand-built, along with an 80mm suspension fork travel for optimum control regardless of the terrain. Additionally, the Vilano 26-Inch Frame Mountain Bike Ridge 2.0 MTB 21 comes with alloy mag wheels,8-speed Shimano EF-51 cohesive shifters for easy gear changes, and is also dependable on mechanical brakes for awesome stopping conditions during any weather conditions on any terrain. Mechanical brakes for control and maximum stopping, thus saving you from causing accidents. Unlike other bikes, fat bikes have over-sized tires, which allow a mountain biker to navigate in any kind of terrain. Fat bikes do not get stuck in any terrain whatsoever. By any terrain, it includes mud, snow, and even sand. Featuring 26” x 4” wide tires on 4” wide aluminum rims the GMC Yukon Fat Bike feels at home in the dirt or the snow. The bike is built around a handcrafted, lightweight aluminum frame. A Tourney rear derailleur, Shimano Revo 7 speed shifter, and an extensive Shimano 14-34 cassette collection provide you with ample gear options irrespective of how muddy, snowy, sandy or rugged the terrain is. If you love mountain biking and wish it would start sooner, much longer or never end, the is the key. The seven speed with Shimano Rear Derailleur and Shifter make shifting of the gears easy while adding power to the bike in preparation for demanding tasks. Stable handlebars for increased comfort and easy acquisition of desired angles throughout the ride. This is one substantial bike, which will offer you the best partnership as you practice your adventurous tours. I cannot fail to mention that the bike will offer you this partnership for a long period, bearing in mind that it has a top class level of durability. The strong frame makes the bike reliable and keeps you away from the repair expenses. This makes the maintenance of this bike cheap thus saving on your wallet. The wheels have an awesome combination of strong rims and knobby tires making the entire bike comfortable and unstoppable over rough terrains. You will love the performance of the shifters, which accommodate rapid gear switches and offer you a swift ride no matter the nature of your riding track. A suspension fork offers you a higher level of comfort and the right angle for your ride. Here I am, back to the men with another awesome bike meant to raise your riding standards to a higher level. If you ever dreamt of a bike, which is elegantly designed and comfortable to ride over both smooth and rough terrains, your dream came true the minute this bike broke into the market. With the awesome features in this Schwinn Men’s High Timber Bicycle, you can be sure of the most comforting ride you can ever access in the market. From the comforting suspension fork to the durable aluminum frame, you will be enticed by the contributions of each part towards offering you an amazing ride. The well-performing brakes are there to enhance the safety of your ride. Try this product and it will not disappoint you today, tomorrow and forever. Rapidly performing shifters that are great regarding making gear changes and allowing you to ride easily up hills and mountains. Well, here is what you did not expect. I am certainly sure that you wouldn’t expect a folding bike that falls under this bracket. To anyone who has been stressing about having a folding bike in the market at affordable prices, well, here it comes. This is one of the most highly ranked bikes in the market regarding convenience. You are capable of performing crazy biking activities on top of this bike, and as usual, about the bikes I bring to you, it has awesome features. This bike has great durability and the overall structure is just what you need. Don’t even mention the epic and eye capturing design. It has an alloy folding frame, which allows you to fold and pack your bike without having to disassemble it. Quick removable handles covered with alloy material for comfort and exclusive grip. Well! I find this as the most amazing bike in the entire market. It is only with the Nashbar Single-Speed 29er Mountain Bike that you don’t need to adjust damn gears to speed up or ride up a hill. This bike proves it right that the impossible and unworthy before eyes of many riders could transform to possible and worth investing in. Nashbar Single-Speed 29er Mountain Bike is the type of bike that excludes the hustle of changing and updating gears now and then during your ride. The pedals are easy to cycle over the terrains and you will love the awesome and continuous ride. The structure of this bike has a nice frame and an elegant design. The brakes are ultimately reliable, and the comfort is deceiving. The entire design of this bike is classy and eye capturing. If you’re looking for the perfect mountain bike that can take you through rough terrain, help you go up hills and not flinch when going over bumps, then you had better try the spectacular Nashbar AT29 Mountain Bike. This machine was made specifically for the rugged life. It is strong and durable. It is good looking and, of course, great on the trail. But don’t take my word for it and take a look at its main features below. This is exactly why I say it’s the perfect mountain bike; it’s made of the industry standard, aluminum tubing. In case you’re wondering, aluminum gives the bicycle a durability that is unmatched. If you push this bike to the limit, it won’t utter a complaint. Even if you’re on the weighty side, don’t worry about easily breaking the Nashbar because the aluminum is strong enough to bear your heft. The aluminum is also a light material meaning the bike is lightweight therefore making it easy to transport. Take the bike to the roughest terrain you can think of and hold the highest speed you can. Notice how easily it soaks up the bumps. That is thanks to the Suntour Suspension in the front wheels that ensure you don’t feel the jagged nature of the trail. And when you’re off the beaten path and on a smooth road where you don’t need the suspension, the hydraulic lockout lever will conveniently make the fork rigid. Clearly, with the Nashbar, riding is no longer a grueling task but an enjoyable experience. This bike won’t only speed along the roads and tracks; it will also reliably keep you safe. You see, it has the Tektro Novella Disc Brakes that aren’t known to fail. So as you’re flying by, these brakes are capable of rapidly getting you from top speed to a total halt at an instant. In whatever condition, these brakes will always show up when you summon them. The Nashbar is made of the durable and lightweight 6061 aluminum material. The Suntour XCT suspension fork easily absorbs bumps. This bike has a 24-speed drivetrain. Tektro Novella Disc Brakes work reliably in all conditions. 29-inch wheels are capable of easily climbing over obstacles. I know it becomes confusing when the awesome bikes in the entire market become increasingly attractive. You may have a lot of troubles trying to understand the bike that will suit the rides you want. That is why, today I bring you the tips on how to select bikes for purchase. Which bike should you select and why? It is super easy and with loads of benefits to select an awesome bike for ride across the country. All you need to do is compare bike features to your biking requirements. There is the bike for your crazy biking activities; also folding bike for your small storage space and henceforth. There is always a bike for you but depending on what exactly you are looking for. That is the only trick. Single speed mountain bikes on the market are meant to serve several purposes. If you are out there looking for an exercise in a bike, this is the bike for you, as it is one of the purposes, the bike is meant to help you through. With a single speed bike, you cannot change the gears to ease pedaling. This makes it impossible to lower the quality of your exercise. The bike will help you go through a continuous high-quality exercise and enjoy outcome at the end of your exercise period as planned. Hence, you can always go for these types of bikes for exercise riding. Hardtail mountain bikes have their specific strengths, which are unavailable in any other type of bike. These bikes are capable of performing various biking activities that cannot be performed by any other bike in the market. In the entire market, there are no bikes, which perform better in climbing activities than the hardtail bikes. These bikes are capable of transferring the pedaling power to the rear wheel more efficiently, boosting its acceleration power. This makes it climb easily and faster as compared to any other type of bike in the market. Hence, for climbing activities, I would say, go for the hardtail bikes. I believe so far, you are sorted regarding your climbing rides with the able hardtail bikes. However, the fact that we have grouped the hardtail bikes in the sector of mountain climbing does not mean you completely scrap them for downhill activities. They could also offer you an awesome downhill activity only that they are not the best in that. However, there is a better type of bikes, which could perform very well in the downhill rides. The FS bike is clearly advantageous better than any other bike in the market could be, when it comes to the downhill rides. Here is a message to two people. If you have a Full Suspension bike, be sure to perform better than anyone does during downhill rides. Secondly, if you are looking for an awesome downhill ride, look no further than this bike. There are numerous advantages behind going for a folding mountain bike for exclusive rides. This type of bikes is much more convenient in the sense of storage, riding and everything else. If you have limited space for storage of such equipment, worry no more. Get this bike and enjoy rides across the world. By folding it while storing, you will require less storage space. This is also the only bike in the entire, market, which will allow you to combine cycling with other transportation forms. You can ride in the first minute and jump into buses and trains in the second minute. This is the bike worth your time and money. Do you want to save time cycling? Are you a busy businessperson looking for the best transport to offer to your messenger excluding an expensive vehicle? Great! You are the one I came for with this extraordinary type of bikes. Electrical bikes are well known for saving your time and offering you a safe ride to wherever. Although it is a spot bike, I do not expect you to go after this bike for exercise purposes. Identify every bike in the market, and the services it is good at offering. Embrace this bike and you will not complain anymore about wastage of time. There are several types of bikes available in the market. The three major types include the rigid bikes with no suspension, the hardtail bikes and the full suspension bikes. All these types are designed in a special way to allow you to perform various biking activities. It is hence more than prudent to consider these types of bikes, what thy offer and compare them to your requirements. Depending on your requirements, you will be directed to the exact type you need. Our wallet capacities are some of the major difference customers will always have. Similarly, bikes in the market will always vary in prices depending on the place you are shopping the bike from, and the quality of its features. It is your duty to compare your financial status to the price tags on the available bikes in the market. Affordability sometimes draws a thick line between you and some bikes found in the shops. If you cannot afford it, do not force it. Just select the affordable bikes for you in the market. You can always spot a bike that will take you through ultimate riding experiences at pocket-friendly prices. This is another silent killer that ends up disappointing many riders in the entire riding world. Many only pay attention to the initial buying cost and forget about the maintenance cost. This happens especially to the people who have to save for decades in order to purchase the bike they want. You will end up buying the bike but having a hard time taking care of its maintenance. Hence, it is essential to make calculations of the maintenance cost right before you purchase your mountain bike. Or personally you can try biclycle tool kit to maintain your bike. I would highly recommend you to buy bicycles in the online selling website. The reason I am deeply in love with the online shopping activity is that there is the highest degree of accuracy. Sometimes you will plan to purchase a high-quality product at a specified fair price, but on the actual shopping activity, you happen to land on unscrupulous business persons, who mislead you with their sweet convincing words. You are capable of purchasing a poor quality product at extremely high prices. Contrary, in the online selling websites, you are assured of quality products, and no one is there to deceive you. You have all the time and freedom to choose whatever you exactly want. It is my humble assumption that I was able to help you in simplification of the shopping process. My detailed list of the best mountain bikes under $500 in the market was meant to reach out to all those who feel depressed by high prices. Now you know that you don’t have to spent much or save for decades to get to the market and purchase a bike for awesome adventurous riding across the world. Bikes at affordable prices can offer you almost all if not completely all you need to achieve the best riding experiences in the world. At the very same lower price bracket, you are capable of spotting bikes that are favorable for race participation. Folding bikes are some of the brands that many believed are damn expensive. Through this article, you now know that they are not an exception in the list of cheap but high-quality bikes in the market.